Polyploidy is a type of condition in which the individuals contains more than two multiples of the haploid chromosome sets. Those individuals in which this condition is found are called Polyploids. And the phenomenon is referred as polyploidy as above mentioned. If an individual has 3n chromosomes, it is termed as Triploids; while the one having 4n chromosomes is known as Tetraploid and an individual with 5n chromosomes is called Pentaploid. The polyploidy is infrequent in animal species, but is well known in lizards, Amphibians and Fish. The polyploidy is more common in plant species. Old number of chromosome sets are not usually transmitted reliably from generation to generation because a polyploid organism without an even number of homologues usually does not produce genetically balanced gametes. For this reason, tripIoids, pentaploids, etc., are not usually found in species that depend solely upon sexual reproduction for propagation. By the addition of one or more extra sets of chromosomes, identical to normal haploid complement of the same species, and the individuals produced are called Autopolyploids, and this type of polyploidy is called Autopolyploidy. The chromosome division followed by failure of division of the nucleus and of the cell results in production of cells in which every chromosome in the original cell is present in duplicate, therefore, these cells have twice as many chromosomes as the ancestral cells do. Formation of such polyploidy cells occur spontaneously and may be produced artificially. The triploids have each chromosome in triplicate, the tetraploids have the diploid chromosome complement doubled and pentaploids, hexaploids and octaploids have each chromosome represented five, six or eight times. The polyploidy may also result from hybridization of two closely related species. The number of chromosomes in F1 hybrid is doubled. Let A represent a set of chromosomes in species X and let B represent another set of chromosomes in species Y. The F1 hybrid will have one set of chromosomes A and another chromosomes B. 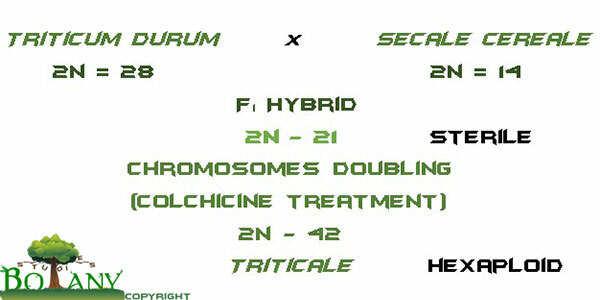 The doubling of chromosomes in F1 hybrid (AB) will give rise to a polyploidy (4n) with two A sets of chromosomes and two B sets of chromosomes. 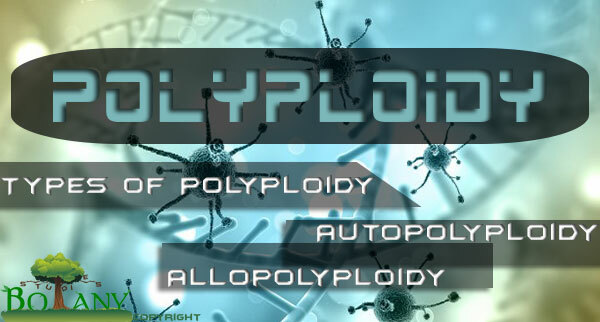 Such a polyploidy is called Allopolyploid and the type of polyploidy is termed as Allopolyploidy. The distinction between auto – and allopolyploid is based on genetic origin of extra chromosome set. In autopolypoidy each additional set of chromosomes is identical to the parent species. Therefore, the Triploids will be 3n and will be represented as AAA, and Tetraploids will be 4n and will be represented as AAAA and so forth. (i) A failure of all chromosomes to segregate during meiotic division may produce a diploid gamete. If such a gamete is fertilized by a haploid a zygote with three sets of chromosomes is produced. (ii) Two sperms may fertile an ovum, resulting in triploid zygote. (iii) The triploids may be produced under experimental conditions by crossing diploids with tetraploids. Diploid organisms will produce gametes with n chromosomes while tetraploids will produce 2n gametes. Upon fertilization, a triploid will be produced. Autotetrapioids are found in larger number than autotriploids because the autotetraploids have an even number of chromosomes, i.e., 4n, therefore, these will produce genetically balanced gametes as compared to those produced by autotriploids. Autotetraploids can be produced experimentally from diploid cell by applying cold or heat shock during meiosis. These can also be produced by applying colchicine to the cells undergoing mitosis. 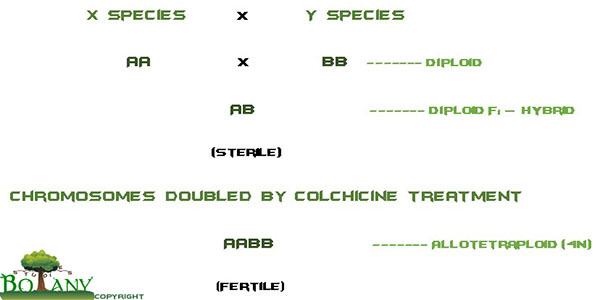 The colchicine interferes with spindle formation and the replicated chromosomes cannot migrate to the opposite poles. When such a cell will re-enter interphase, it will be converted to 4n. The autopolyloids are generally larger than their diploid relatives. Usually the flower, ovum and fruits are of larger size. Although the autopolyploids do not contain new information as compared to their diploid relatives; however, these varieties are commercially important. Economically important autotriploid plants include several Potato species, Winesap Apples, Water-melons, and commercial Bananas. The diploid bananas contain hard seed, but commercial triploid seedless bananas have edible seeds. Sugar-beet, Tomato and Grapes are also autotriploids. Autotriploids are propagated asexually. Autotetraploids like Alfalfa, Coffee and Peanuts are also of economic value because either they are large or grow more vigorously than their diploid counterparts. Autotetraploids are also known in Rye (Secale cereal), Corn, Redclover (Trifolium pratense), Marigolds (Tagetes), Snapdragons (Antirhinum), Phlox, Grapes, Apples, etc. While Allopolyploids result from hybridization of two closely related species. The hybrid produced will be sterile because of its inability to produce viable gametes. The new genetic combination may undergoes a natural or induced chromosomal doubling, and a fertile tetraploid is produced. The hybrid contains unique information as compared to either parent. Such an organism is called Allotetraploid. Allopolyploidy is the most common natural form of polyploidy in plants because the chance of forming balanced gametes is much greater than in other types of polyploidy. Since two homologues of each specific chromosomes are present, the meiosis may occur normally and fertilization may successfully propagate the tetraploid sexually. A classical example of allotetraploidy in plants is the cultivated species of American cotton (Gossypium). This species has 26 chromosomes, 13 large and 13 small. It was found that old world cotton had only 13 pairs of large chromosomes and wild American cotton had 13 pairs of small chromosomes. It was suspected that American cotton may be an allotetraploid and may have originated through a cross between the old world cotton and wild American cotton. The suspection was confirmed by J. O. Beaseley experimentally. He crossed old world strain with the wild American strain and then treated the F1 hybrid with colchicine to double the chromosome number. He obtained a fertile allotetraploid variety of cotton containing 26 pairs of chromosomes and characteristics similar to the cultivated variety. The allotetraploids usually exhibit characteristics of both the parental species. This can be noted in the hybrid resulting from a cross between the radish (Raphanus sativus) and the cabbage (Brassica oleracea). 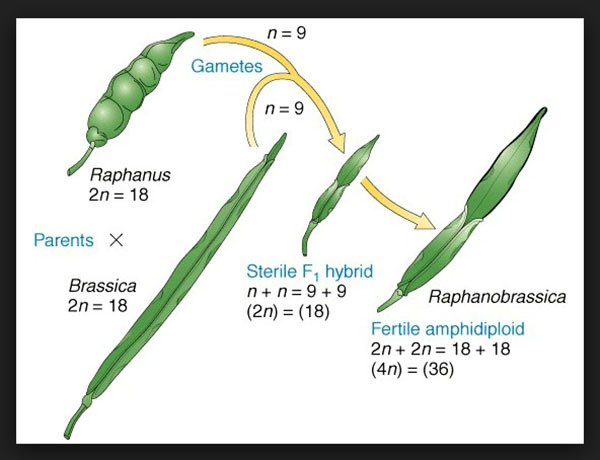 The hybrid consists of 9 Raphanus and 9 Brassica chromosomes (9R + 9B). The hybrids are almost always sterile, but some fertile autotetraploids (18R + 18B) been produced. Unfortunately, the root of this allotetraploid is more like the cabbage and its shoot resemble the radish. Therefore, this hybrid has no significant economic value. Had the converse occurred, the hybrid may have been of economic importance. This allotetraploid was named Raphanobrassica. Common cultivated Wheat is another example of allopolyploidy. There are three different chromosome numbers in genus Triticum, namely 2n = 14, 2n = 28 and 2n = 42. The common wheat is a hexaploid with 2n = 42, and is derived from three diploid species: (i) AA = Triticum aegilopoides (2n = 14); (ii) BB = Aegilops speltoides (2n = 14); and (iii) DD = Aegilops squarrosa (2n = 14). The hexaploid Wheat (2n = 42) is therefore, designated as AA BB DD, the tetraploid (2n = 28) as AA BB, and diploid (2n = 14) as AA. Evidence is available now that suggests that A, B and D genomes from three diploid species mentioned above are much different from, one another, so it is believed that three diploid progenitors of common hexaploid Wheat were derived from a common ancestor, For this reason the common hexapoloid wheat is now considered as an autopolyploid rather than an allopolyploid. A much more successful commercial hybrid has been raised by crossing the grasses Wheat and Rye. Wheat (Triticum) has a basic chromosome number of 7. The diploid species have 14 chromosomes. Other cultivated autopolyploids exist as tetraploids (4n = 28) and hexaploids (6n = 42). Rye (Secale) also has a basic chromosome number 7. The only cultivated, species is diploid (2n = 14). When tetraploid wheat is crossed with diploid rye, and F1 hybrid was treated with colchicine, hexaploid hybrid (6n = 42) is produced. The hybrid designated as Triticale, represent a New Genus. Octoploids may also be produced from crosses between hexaploids wheat and diploid rye. But the hexaploid hybrid is more stable. Fertile hybrids can be crossed together or back-crossed to the parental varieties. These crosses have resulted in a wide variety of the member of the genus Triticale. We can take both wheat and rye as an beneficial hybrid model in crop improvement. The hybrids demonstrate characteristics of both wheat and rye. For example, certain hybrids combine the high protein content of wheat with the high content of the amino acid lysine of rye. The lysine content is low in wheat and thus is a limiting nutritional factor. Wheat is considered a high-fielding grain, while rye is noted for its versatility of growth in unfavorable environments. Triticale combining both traits have the potential of increasing grain production.